The word Rangrez means dyer in Persian. Traditionally they dyed cloth. Long ago the Rangrez people group had lived in India. Back then they had been Hindus and had worshipped Vishnu. Centuries ago Muslim missionaries converted this people group to Islam. They maintain a low to middle caste status wherever they live in South Asia. Most Rangrez people live in India's northcentral states and Pakistan's Punjab Province, but there are also some who live in Bangladesh. Since the partition of India in 1947, many Rangrez moved to Pakistan; but many still live in India. A few went east to Bangladesh. paved a way for some to be small businessmen. Yet they are best remembered as people who dye cloth. Some have adapted modern ways to dye, while others use large tubs where they dip cloth into water mixed with thick, colorful dye. They often dye the cloth several times to get it to match the tone their customer wants. When the color is right, they leave the cloth out to dry. The Rangrez people have pride in their skilled work. 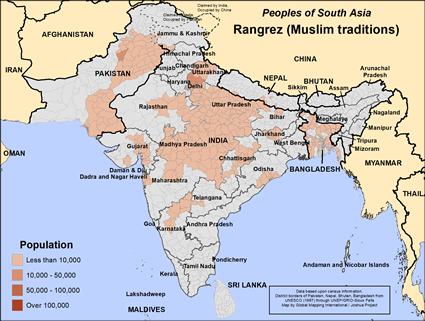 The majority of Rangrez people in Bangladesh are Muslim today, though there are some Hindus among them in India. They believe that the best way to live is to obey the teachings of the Qur'an and their prophet Mohammed. The Rangrez people need new outlets for their business. They are now competing with cheap factory-made cloth from China. 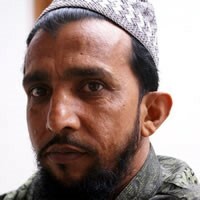 * Pray that God will give Rangrez leaders dreams and visions leading them to salvation. * Pray for the Holy Spirit to give Rangrez leaders a hunger and thirst for true righteousness that will lead them to Jesus Christ. * Pray for a disciple making movement to raise up among the Rangrez people in Bangladesh. https://joshuaproject.net/people_groups/17972/PKView Rangrez (Muslim traditions) in all countries.